Death Knights are one of the strongest PvP classes in the game, boasting high damage (both consistent and burst) in addition to self heals, silences, and other spell caster/healer controls, as well as a few self and team buffs. Death Knights have two talent builds which are viable at the highest levels of play in the Arena, Frost & Unholy. Blood, which is used primarily for PVE tanking, something that’s not as useful in nearly any situation save that of carrying flags in a BG and even then there are those more suited to that role. If you’re not yet level 90 and want to get your character to max level quickly, take a look at this leveling guide. Changes to the talent system and your abilites have arrived with Mists of Pandaria. You can see those changes on our Mists of Pandaria Death Knight page. Blood PvP Build – While I wouldn’t say that Blood is useless in PvP, it’s certainly not as effective as Frost or Unholy. Blood is mainly used for Battlegrounds, specifically random Battlegrounds, as it’s there that the toughness of blood can be made effective against less organized/skilled groups, despite the lack of burst damage. Frost PvP Build – Frost has less survivability than Unholy, but boasts a greater amount of CC (Crowd Control) and very good critical damage bursts. Unholy PvP Build – Unholy Death Knight’s bring good damage (incredible when played perfectly) and have better survivability than Frost due to an improved Anti-Magic Shell. Properly managing your ghoul pet is a large part of maximizing your effectiveness as an Unholy DK and in providing burst damage at crucial times. Unholy is probably more popular in the arena than Frost. In Legion, as soon as you zone into a PvP instance, the stats on your gear will be nullified, and you’ll be given a pre-determined set of stats that’s uniquely configured for your specialization. Furthermore, any set bonuses, enchants, Legendary bonuses, or trinket effects will be deactivated (although your Artifact and its related Artifact Powers will remain active). The only contribution your gear will make to your overall power is through a small modifier based on your average item level. For every point that your average item level increases, your pre-determined PvP stats will increase by 0.1%. That means a 25 item level difference between two players only results in a 2.5% difference in stats, compared to the 25% difference it makes today. There’s still a little incentive to improve your gear – a concept we think is important for World of Warcraft – but the benefits are much less pronounced. So your ilevel 850 character will have a much small advantage over that ilevel 750 character than you’re trying to gank. Or murder in that BG. Conquest geared players vs those all in greens will make a much small difference than before. In Legion skill counts, more than ever before. We’re also doing away with the idea of PvP-specific gear. Since your stats are pre-determined, trinkets and set bonuses are disabled, and your item level gives only a small increase, we don’t need to worry about making you wear a separate set of gear in PvP. So, in Legion, gear is gear, regardless of where you earned it, with no PvP-specific stats or fluctuating item levels, and the best players in both PvP and PvE content will be able to earn the best gear. Prior to Warlords the high end gear came with a number of gem slots. I warlords they became few and far between and only on gear that was obtained as an award or in an earned box or chest. Also, all gems slots become prismatic, meaning that any gem color would fit into any gem slot. 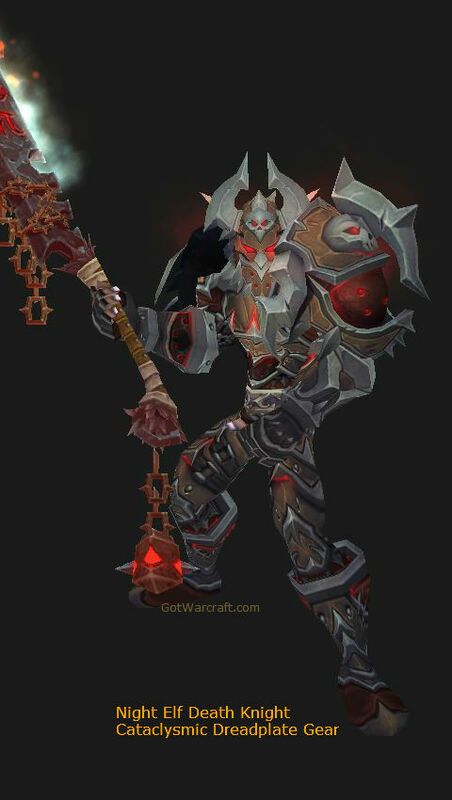 Legion is following in the same model as Warlords. If you’re level 90 and under just gem for Strength. Level 91-100 the gems only add secondary stats, so gem for your best stat from Haste, Versatility, Crit, or Mastery. See our individual pages for better detail on your stats. Level 100+ it looks like gems will again add Str, so gem for that. Saber’s Eye of Strength gives +200 Str. Other Str gems (blue or green quality) will be much cheaper. Neck: Enchant Neck – Mark of the Claw +550 to both Haste and Crit. or Enchant Neck – Mark of the Hidden Satyr, which casts an occasional damaging bolt at your enemy. None: Chest, head, legs, feet, gloves, shoulder, belt, wrist. Weapon: Well, it’s an artifact, but you have an unfair advantage (which will probably be nerfed at some point.) You can put your regular Death Knight runeforges on your artifacts. No one else gets weapon enchants. Frost, off-hand: Rune of Razorice.